The Chase Freedom card offers bonuses on purchases at Gas Stations, Drug Stores and on Tolls. If you haven’t already activated your card you can do that HERE. The Discover Card is offering 5% cash back on purchases at Grocery Stores. You must register before you will receive the bonus cash back. You can do that HERE. 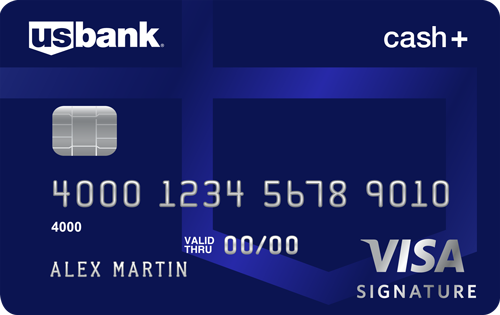 And finally the US Bank Cash+ card offers choices of a number of different categories for you to decide what works best for you. You can pick 3 categories that will earn 5% back and one category for 2%. All other categories will earn 1% cash back. You can make those choices HERE by logging into your account on the US Bank website. 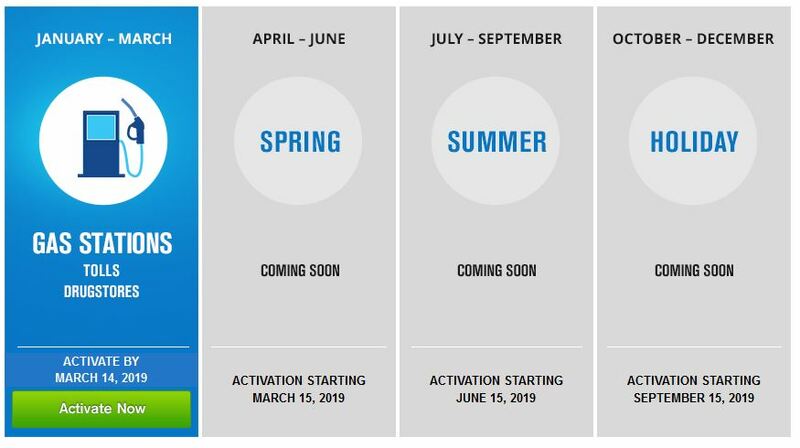 Activate 2019 Q1 Quarterly Bonus Categories! We’re just a couple of weeks away from the end of the year, so it’s time to register for the category bonuses for the first quarter of the new year. Once again Discover has released their bonus categories for the whole year. The first quarter’s category is Grocery Stores, which should be pretty easy to max out. To register, just log into your Discover account online or visit this link to log in. Note that to receive the 5% cash back you must register first before making your purchase. You can earn 5% back on up to $1500 in purchases. US Bank is offering the same categories as for Q4 2018 though you can choose the ones that work best for you. Select 1 of the 2% categories and 2 of the 5% categories, based on your needs. For the 5% category you can earn the 5% on up to $2000 in purchases. To select your categories, visit the US Bank Cash+ website. And then you’re ready to go! Can you believe we’re almost three-quarters of the way through 2018? As we approach the end of the third quarter, that can only mean it’s time to register for fourth quarter credit card bonuses. Discover’s Q4 categories are ones that are handy for the holiday season: Amazon and Wholesale Clubs. To register, just log into your Discover account online or visit this link to log in. Note that to receive the 5% cash back you must register first before making your purchase. You can earn 5% back on up to $1500 in purchases. US Bank is offering the same categories as for Q3 though you can choose the ones that work best for you. Select 1 of the 2% categories and 2 of the 5% categories, based on your needs. For the 5% category you can earn the 5% on up to $2000 in purchases. To select your categories, visit the US Bank Cash+ website. For the fourth quarter the Chase Freedom card will earn 5x points at Wholesale Clubs, Department Stores and for using Chase Pay. As in previous quarters this offer is good on up to $1500 in combined purchases for the quarter. I no longer have a warehouse club membership, don’t use mobile payments and can’t remember the last time I bought something at a department store so these categories don’t help me much, sadly. But be sure to register ASAP so you’ll earn your bonus points! Discover Card will net you 5% cash back when you use your card at Restaurants this quarter. The most important thing to remember is that you must register your card before you’re eligible to earn the 5% back. If you haven’t done it yet, do that now! To make your selections, log into your account. Freedom is offering 5x Ultimate Rewards points at gas stations, Walgreens and for Lyft rides. Ultimate Rewards can be spent as cash back on your statement at a value of a penny a point, or if you have one of the paid UR-earning cards, like the Sapphire Preferred or the Sapphire Reserve, those points can be combined with the URs you earn through those cards and transferred to an airline or hotel partner. You may end up getting more than one cent per point value in that instance. If you haven’t already activated your bonuses, you can do that here. It’s time to activate your bonus categories for the cards that offer quarterly bonuses. All of these cards will give you bonus cash back (or points) for up to $1500 in spend during July, August and September. For the Discover Card, restaurants will earn you 5% cash back. Remember that you must activate your Discover Card bonus BEFORE making any purchases or you won’t get the bonus cash back. To register your card, look for the email that should have been sent to you or visit this link. With the US Bank Cash+ Visa you can select one of three 2% categories and two of twelve 5% categories. To me the home utilities category is a no-brainer as I know I’ll spend several hundred dollars there each quarter and I know of no other card that offers that category. Though Chase markets this as a cash back card, in fact you’re earning Ultimate Rewards points. And you can redeem each point for a penny off your credit card bill. But if you’ve got one of Chase’s Ultimate Rewards-earning (UR) cards with an annual fee (like Sapphire Preferred, Sapphire Reserve or one of the Ink cards) you can combine the URs you earn via the Freedom card with the URs earned with the other cards and get more than one cent per point in value from those URs. 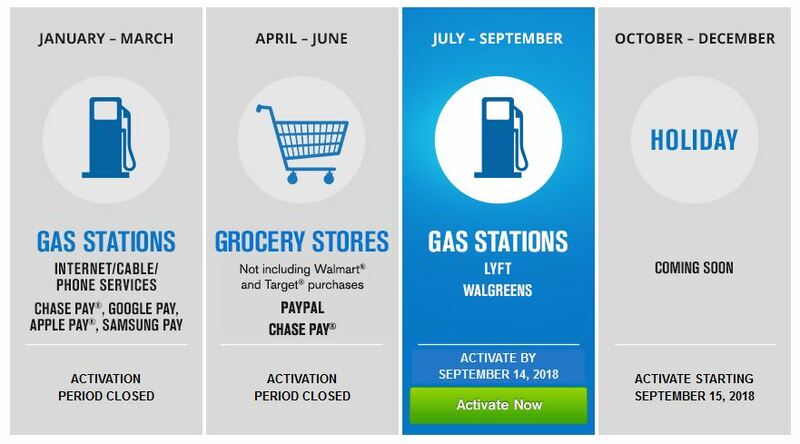 For the third quarter of 2018 the bonus categories are Lyft, Walgreens and gas stations. This doesn’t help me much as I very rarely use ride-sharing and have never used Lyft, the Vanilla pre-paid debit cards found at Walgreens cannot easily be turned into cash and the gas stations around here will not allow the purchase of pre-paid debit cards with a credit card and they often don’t have the $500 denomination anyway. You can activate your Chase Freedom card bonuses here. So for me it looks like I’ll be using my Discover card at restaurants and my Freedom card at the gas pump in Q3. It’s a new quarter, activate bonus categories now! Today is the start of the second quarter of 2018 so time to activate your bonus categories if you haven’t already done so. 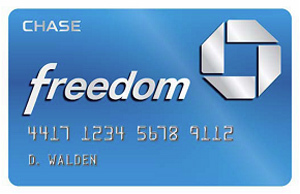 The Chase Freedom, Discover and US Bank Cash Plus cards all offer 5% bonus categories good for up to $1500 in spend. Both Discover and Chase Freedom have grocery stores as their category though with the Freedom card you can also use Chase Pay or Paypal to earn bonuses. The US Bank Cash Plus card allows you to pick your 5% category and new this quarter is home utilities. That’s a great category and I’m not aware of any other card offering that category so I hope it sticks around. I don’t know if it includes telephone and television services or not but if you don’t have a Chase Ink card to earn 5% on those categories it’s certainly worth testing out. More information on the categories and how to register can be found in this post. 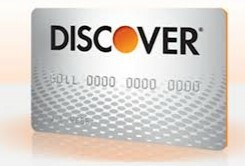 Don’t forget that to receive the Discover 5% cash back you must register before using your card. Registration is now open for quarterly bonus categories for the Chase Freedom, Discover and US Bank Cash+ cards. 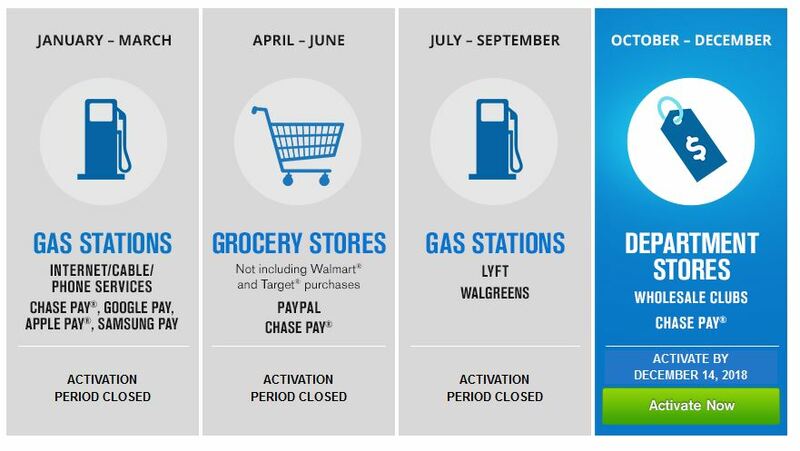 Starting today you can register your Chase Freedom card and in April you’ll receive 5x Ultimate Rewards points on purchases made at grocery stores, Paypal and on purchases made through the Chase Pay mobile payment system. 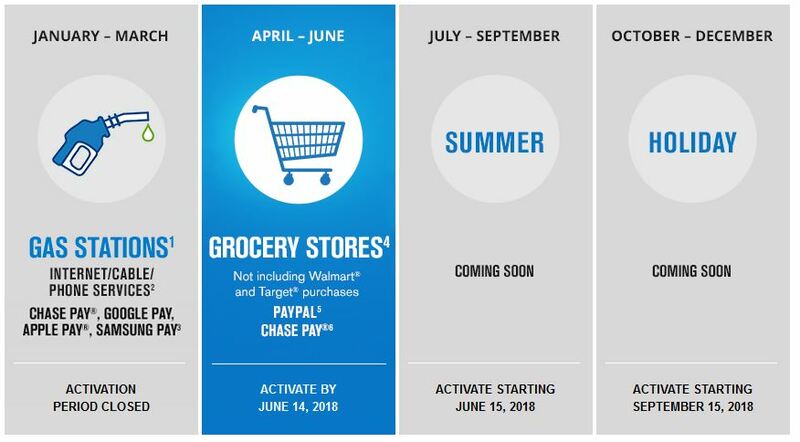 You must activate by June 14, 2018 to earn 5x during this quarter but you don’t have to activate before you make your purchases. You can earn the 5x points for up to $1500 in purchases. After that you’ll earn the usual 1x points per dollar. Note that you won’t earn points at Wal-Mart or Target grocery stores unless you pay via Chase Pay or Paypal. 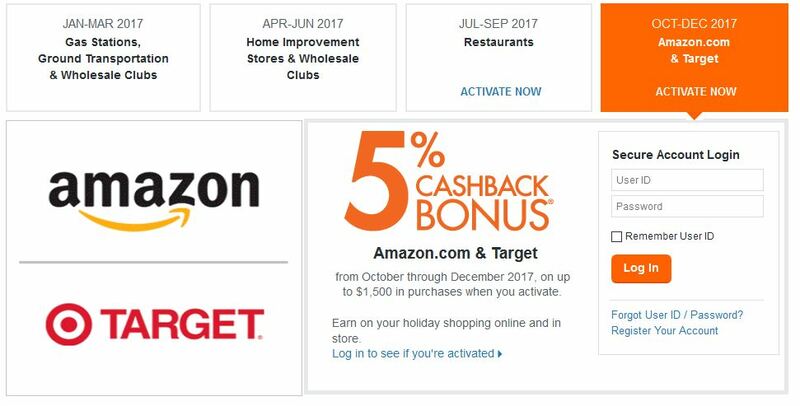 Discover has chosen to reveal their entire 2018 calendar and for the second quarter their 5% cash back category is Grocery Stores. To register, just log into your Discover account online or visit this link to log in. Note that to receive the 5% cash back you must register first before making your purchase. You can earn 5% back on up to $1500 in purchases. US Bank is changing things up just a little by adding Home Utilities and removing Bookstores. Select 1 of the 2% categories and 2 of the 5% categories, based on your needs. For the 5% category you can earn the 5% on up to $2000 in purchases. To select your categories, visit the US Bank Cash+ website. Starting today you can register your Chase Freedom card and starting in January you’ll receive 5x Ultimate Rewards points on purchases made at gas stations, for internet/cable/cell phone service and on purchases made through mobile pay systems like Apple Pay, Android Pay, Chase Pay and Samsung Pay. You must activate by March 14, 2018 to earn 5x during this quarter but you don’t have to activate before you make your purchases. You can earn the 5x points for up to $1500 in purchases. After that you’ll earn the usual 1x points per dollar. 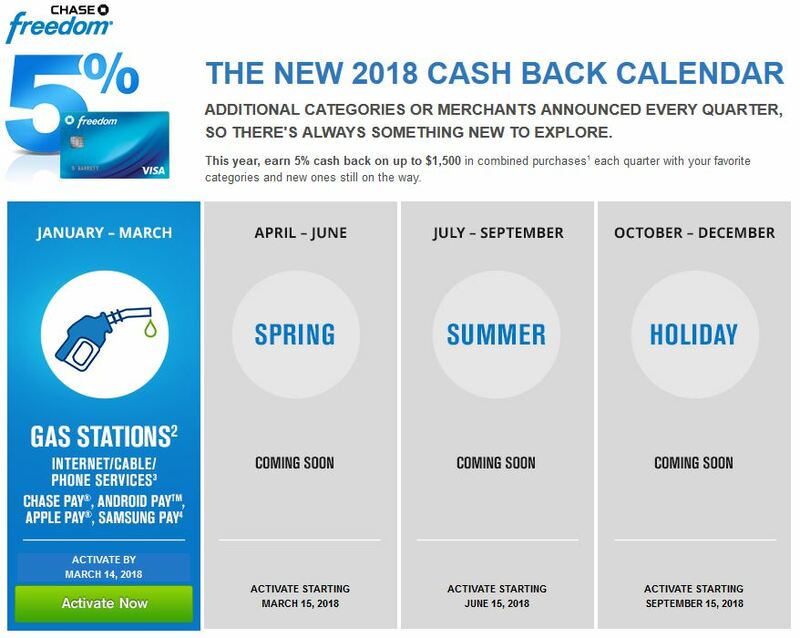 Discover has chosen to reveal their entire 2018 calendar and for the first quarter their 5% cash back categories are Gas Stations and Wholesale Clubs. To register, just log into your Discover account online or visit this link to log in. Note that to receive the 5% cash back you must register first before making your purchase. You can earn 5% back on up to $1500 in purchases. US Bank is always the first to reveal the categories for the next quarter. As we reported last month, they have their usual array of categories for you to select 1 of the 2% categories and 2 of the 5% categories, based on your needs. For the 5% category you can earn the 5% on up to $2000 in purchases. To select your categories, visit the US Bank Cash+ website. I’m a big fan of Hyatt Place and Hyatt House properties. The rooms are like small suites with separate sitting and bed areas. Some properties actually have suites as well. When you’ve got three people, none of whom want to share a bed, these properties have rooms with two queens plus a pull-out sofa that make it perfect for me and my traveling buddies. 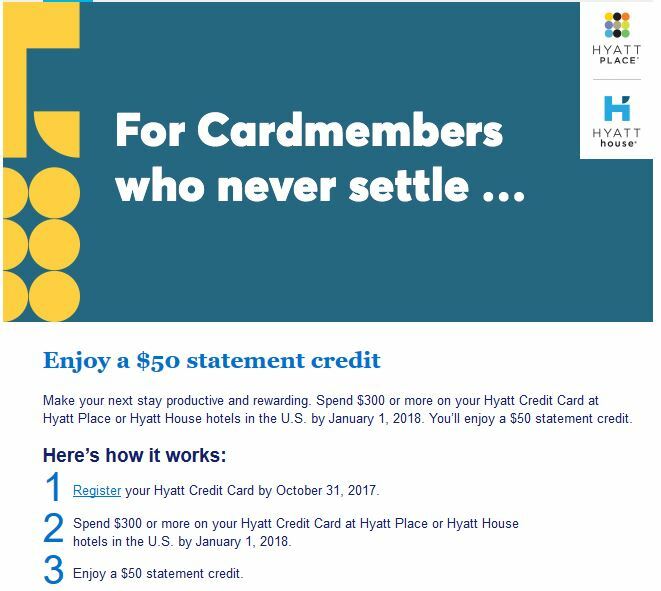 Now Hyatt is offering a $50 statement credit when you use your Chase Hyatt Visa card to spend $300 or more at Hyatt Place/Hyatt House properties between the time you register and the end of the year. To sign up for the promotion, check your email inbox for a link, or you can click HERE. This will take you to a page where you can enter your email address, Hyatt Gold Passport number and your credit card number. Once you’ve done that, you’re registered! Don’t have a Chase Hyatt Visa? You can apply for one HERE and a deserving blogger (not me) will get a referral credit. As happens each quarter, three card issuers offer bonus categories for the following quarter. As of today you can finally register for all three.